The influences of William Wordsworth’s writing and evolutionary theory—the nineteenth century’s two defining visions of nature—conflicted in the Victorian period. For Victorians, Wordsworthian nature was a caring source of inspiration and moral guidance, signaling humanity's divine origins and potential. Darwin’s nature, by contrast, appeared as an indifferent and amoral reminder of an evolutionary past that demanded participation in a brutal struggle for existence. Victorian authors like Matthew Arnold, George Eliot, Robert Louis Stevenson, and Thomas Hardy grappled with these competing representations in their work. They turned to Wordsworth as an alternative or antidote to evolution, criticized and altered his poetry in response to Darwinism, and synthesized elements of each to propose their own modified theories. Darwin’s account of a material, evolutionary nature both threatened the Wordsworthian belief in nature’s transcendent value and made spiritual elevation seem more urgently necessary. 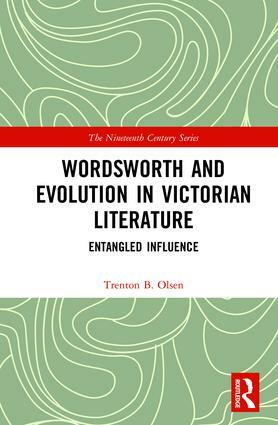 Victorian authors used Wordsworth and Darwin to explore what form of transcendence, if any, could survive an evolutionary age, and reevaluated the purpose of literature in the process. Trenton B. Olsen completed his PhD in English Literature at the University of Minnesota and is currently Assistant Professor of English at Brigham Young University–Idaho. His work has appeared in Victorian Literature and Culture, The George Eliot Review, and The Journal of Stevenson Studies. He received the 2017 Idaho Humanities Council Research Fellowship and the 2018 George Eliot Essay Prize.